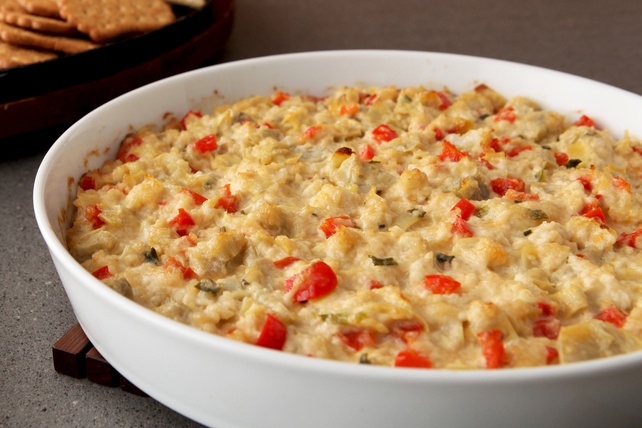 Artichoke hearts, crabmeat, red pepper, green onions, MIRACLE WHIP and Parmesan cheese are baked into a delicious hot appetizer spread. Heat oil in large skillet on medium heat. Add peppers and onions; cook 5 min. or until peppers are crisp-tender, stirring frequently. Remove from heat. Add remaining ingredients; mix well. Garnish with additional chopped red peppers and green onion slices before serving.